From today's papers. Can't read the small print? Read at Star Online. If you are a retiree from the lower or middle income group, the biggest fear you probably have is not having enough funds to see you through your retirement. 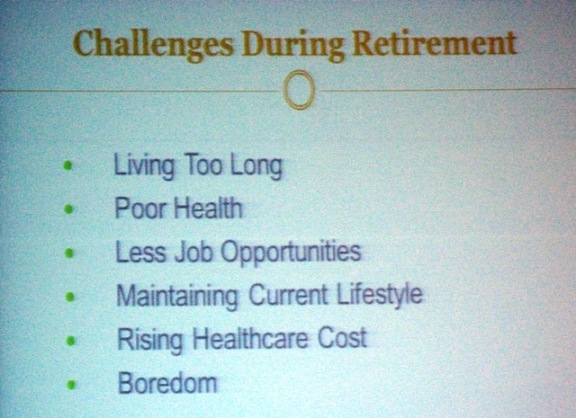 What compounds the fear is the knowledge that your retirement can last as long as 20 years! Throw in healthcare expenses and you feel like throwing in the towel on life itself. For retirees who are single or without children, old age is viewed with more than just dread. When they can no longer fend for themselves financially and physically, who is there to offer support? Who can they depend on? Boredom may be at the bottom of the list, but it can lead to depression and that can lead to health complications and higher healthcare costs. A vicious cycle that is difficult to get out of. For those with children, don't be so sure your adult children will care for you. They may not have the financial means to do so, or they may not even be around, having migrated to greener pastures overseas. With filial piety on the wane, cases of adult children abandoning their elderly parents in hospitals and old folks home are on the rise. To calculate how much you need for your retirement, click here. Longevity is a bonus only when retirees have saved enough and prepared adequately for their sunset years. "The magic formula is to stay healthy, maintaining social support, keeping spiritual life and finances in order, and developing a daily routine that can help prevent stress after retirement." Very nice and informative blog related to retirement.Retirement is the stage where you are confused and don't have anything to do and the thing you have is only that you get employed at the place where there is no age criteria but today you don't get such job.So retirement matters to middle class groups. Lily, as far as the so-called golden age is concerned, it all boils down to money. Health wise, if you have kept yourself in reasonable trim, it should not be a problem. But at least, if you have the money, many health problems can be alleviated. Without the dough, you are a dead duck. That's the fact of life. Money isn't always the solution when it comes to many health problems, especially terminal diseases and mental diseases. The younger generation should pay heed to prevention which is cheaper rather than expensive cures. The Health Ministry should step up its public health awareness campaigns and education. It's not doing enough.